I have shared with everyone a lot of the places that I love to visit during the fall. The list is mostly made up of places that I can clearly see the transition from summer into fall but there are other places that I love to visit at the start of fall for one big reason . . . kids are back in school and the crowds are less. What places do you what to visit once the crowds die down? Disneyland or any theme park: Let’s be honest . . . it is a lot of fun to go with kids especially if it is their first time BUT, theme parks are fun for adults too and more so when you know you don’t have to worry about height restrictions, losing someone to the crowd, or having someone eat the churro you have been craving for a solid year or more. 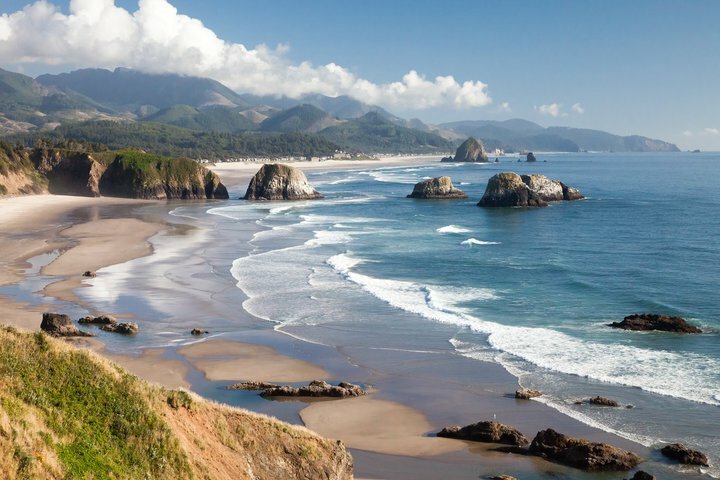 Cannon Beach or any coastal town: The beach is at its peak during the summer. Hot temperatures helps regulate your body against the coolness of the water but don’t you just hate planning a day at the beach to have it dashed to pieces because you can’t find a parking spot, a place to lay your towel down, or even a place to bob in the waves without getting hit by someone’s surf board, boogie board, paddle board, etc.? If I have to wear a wet suit to avoid hypothermia, then so be it. Hawaii or any island: I lived in Hawaii and I absolutely love it anytime of the year but I loved it the most when people went back to the mainland for the majority of the year. Paradise can feel an awful lot like Los Angeles when there are a ton of people. The Grand Tetons/Yellowstone or any National park: This is sometimes hard to do when not the summer months because some parks close for season but if you can manage to find the small window of opportunity between Labor Day and the season closing, you will love it! The significant drop of cars driving in the parks is reason alone to wait until summer has passed. The park rangers and all other staff providing services in the park are more “chill” and you feel like you are stepping into a wonderland (what a national park should be) instead of getting on a ride at a theme park. Salt & Straw Ice Cream or any locally celebrated establishment: Got to love the internet but . . . ultimately that is how everyone learns about the unique things to do in a city they are visiting. Local establishments are great and the locals like them but not when we see a line longer than three blocks. I live for the off-season and the hours of day when even locals are busy with work and school to go and visit the places that I see on the internet as well. Well, you know me……………I’m going for Jellystone! Wish we could just take a week and wander that beautiful park! Thanks for reminders of wonderful places! Maybe we can get down to the beach before I go! I am up for Yellowstone as well and the beach and any place that I can enjoy without all the crowds. Ice cream is good any time of the year, thank goodness, so Salt and Straw will be just as delicious in October-March as in the summer. A great list. Lack of cars is like hitting the airplane middle seat lottery! So true! Fall travel lottery . . . got to love it!